The Knicks have signed PF Derrick Williams. Williams was the #2 pick in the 2011 NBA Draft. The 6’8 Williams, who played his college ball at Arizona, began his career with the Timberwolves before being traded to the Kings. Williams possesses elite athleticism and great length. He is a very good finisher at the rim (70%) and is dangerous in transition, where he has the ability to blow by defenders and throw down highlight dunks (one of which is pictured above, against a solid defender in Bismack Biyombo). While he has the tools to be a good defender, he is mediocre on that end, due to inconsistent effort and faulty awareness. Williams is not a good jump-shooter, although, at 32% from 3, he could become a decent shooter for a forward if he can make a slight improvement (maybe around 37%). 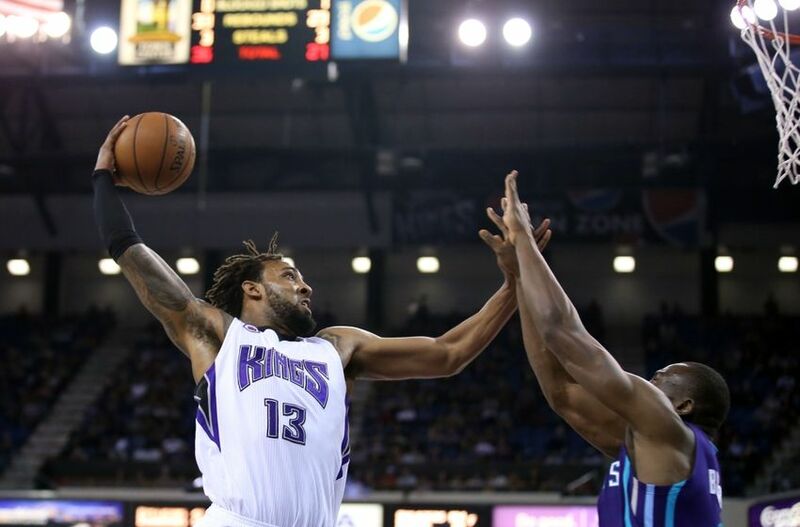 Williams averaged 8 points and 3 rebounds per game in 20 minutes for the Kings last season. Player Analysis: Williams has useful traits and obviously has upside, but he is by no means a bona-fide starter, and the Knicks could use more talent at the wing, preferably somebody who could shoot or defend, if not both. However, the Knicks do need players who can get to the basket, and Williams is one of those guys. Contract Analysis: The Knicks will pay Williams $10M total over 2 years. Williams has a player option for the second year. I really don’t like this contract. The Knicks had about $7.3M left in cap room, and they’re probably somewhere around $3M now, along with the $2.8M “Room Exception.” The Knicks needed another starting Forward (is this the guy? ), a backup center, and probably a shooter and another PG. Williams gives them youth, athleticism, and slashing ability, so he has value. But they might have been able to do better with this money, or get Williams for less. The thing that really bugs me here is the Player Option. Williams obviously has upside— he was the #2 pick in the draft just a few years ago. And the Knicks seemingly paid for that upside— overpaid, even. But let’s say Williams reaches that upside this year. Let’s say he plays well (not very well, but well). Let’s say he blossoms into a guy who can definitely be a starter. If that happens, Williams will opt out, and the Knicks will have to spend more than $5— perhaps well more, to retain his services next year. That being said, the Knicks continue to acquire players who make this team better than it was last year. This roster is starting to shape up. It won’t be great, but it could be pretty good. There are still a few more moves to be made. This entry was posted in Articles and tagged Derrick Williams, Derrick Williams Knicks, KNICKS, KNICKS MEMES, Knicks news, tommy rothman knicks on July 3, 2015 by Tommy Rothman. while I’m sure most are upset with Phil’s moves they will actually turn out to be quite astute. Grant will be our 6’5 starting pg and an excellent floor general…think Derrick Harper in his prime at worst. KP is a mystery so i have no prediction there. Aaron is a massive upgrade over Shump/JR because his basketball IQ and consistency at both ends in unassailable if not spectacular. bear in mind we got him at an excellent price with no long term lock. RoLo is actually the best fit for the Knicks…much better d than Monroe, better screens, better hustle, better spacing and better NYC grit. the deal is also manageable finically and frankly we needed a big with D more than a big with O. Derrick Williams is a steal…steal of free agency if you understand basketball. look at his last 14-24 games last year…it all started to come together. Fish and Phil will fix his head as that’s been the issue. he is an elite talent with all the skills to be a lock down defender and tough cover at PF if he gets his confidence back. his shooting is going to get better and actually Melo will help him immensely in this regard as Melo has an excellent stroke and will love D Thrill as he not a threat but a compliment and 24! D Thrill is an excellent finisher and can crash the boards at 245/6’8 with ridiculous hops. this is actually a competent, intelligent squad of basketball players who will hustle like NY’ers expect. Grant is a stud and will be starting pg by mid season. AA 15 and 6 a night. RoLo 10 and 10 a night. D Thrill 14 and 7 a night. not bad moves. i think Grant can be a 12 and 6 asst a night rookie. KP is a wildcard so i give him a low 6 and 4 a night. Melo will put up 24 and 6 per. thats 76 points a night without Calderone, Clee Early, Smith, Arcy, etc chiming in for a combined 20+. we could be worse off and we have flex in the years to come when Melo$ come off the books and we have picks again and a higher cap. This squad won’t win rings but can get to the playoff in a weak east and make the Knicks a solid squad. if KP is even worth of a top 10 pick by 2017 we could be fun to watch play hoops again. the triangle btw will work with the collective IQ of this team in a way in never could with last years team.